For as long as I can remember, I’ve been fascinated by the Universe — both the very, very large, and the very, very small — and found great excitement and pleasure not only in seeing the beauty that exists both without and within, as mesmerizing and terrifying as anyone could imagine, but also in the exercise of trying (though not necessarily succeeding) to wrap my head around the immense differences in scale, and the scientific explanations of how things work and how they came to be, explanations that become more detailed and accurate as our tools and our understanding of nature increases. One of the most profound sciences that repeatedly strikes me with awe is astronomy. This blog post is an expansion on a small piece I wrote on Facebook earlier, with a few extra but relevant — or at least I think so — bits added to the end. 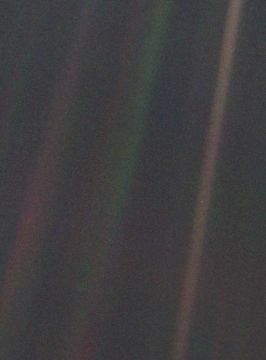 If I were to name two astronomy photos that are the most humbling to me in the face of the Universe around us, I would firstly name “The Pale Blue Dot”, the image of Earth, appearing as nothing more than the tiniest speck suspended in vast nothingness, taken by Voyager I in 1990 from beyond the orbits of Neptune and Pluto, accompanied by Carl Sagan’s narrative. It’s hard enough to properly grasp the size of our home planet when we’re standing on it. It seems incomprehensibly large to one’s eyes, and even when you know full well that it has finite bounds, it appears as if to be a whole universe unto itself, with uncountable wonders and mysteries, most of them yet to be uncovered. To then perceive it as almost nothing compared to an empty void that despite its vastness is not even close to infinity, can take a tremendous, overpowering toll on the mind and the imagination. 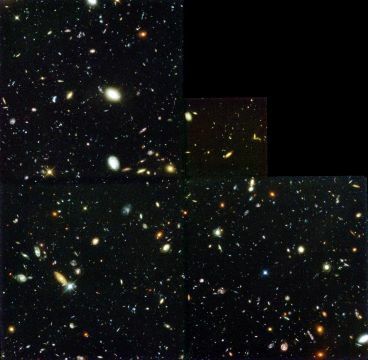 The second would be the Hubble Deep Field image from 1995, where the space telescope looked outwards into a tiny, dark patch of sky which until then had seemed to us like nothing but empty space, yet it turned out to contain galaxies upon galaxies upon galaxies, each containing billions and billions of stars, stretching into unimaginable distance, and backwards into unimaginable time. Either one of those two images, the Pale Blue Dot looking inwards, and the Hubble Deep Field looking outwards, and even more so when considered together, tell me that we are are next to nothing in the face of Cosmos, that this place, whatever caused it to exist, was not made for us, and if it was in any way created, it was not created with us in mind. We are too small, too insignificant, to matter in the grand scheme of things. But they also tell me that we are part of something immense, something tremendously big and beautiful. We are in the Universe, and the Universe is in us. And when we are so small in the face of it all, when our existence is so minuscule as to seem overwhelmingly meaningless, then we should value it even more than we seem to do. We may not matter much to the Universe at large, it may not even know or notice that we are here, but we should certainly matter to each other, and we should make the most of our tiny place on this mind-boggling stage, and cherish the experience of being alive, together. Welcome to the Universe. It is the biggest thing you will ever know. The history behind the Hubble Space Telescope, an embarassing failure that was turned into a tremendous success, and the birth of the idea and the mission that became the Hubble Deep Field image. Where is the Hubble Deep Field at? And to think that such a daunting and mind-boggling image as this is taken from somewhere as homely and familiar as just above the Big Dipper, which even most children will easily be able to find in the sky. That’s practically in the back yard. 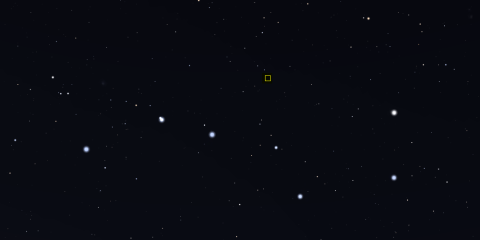 The little yellow square shows the approximate location of the Hubble Deep Field. Not to scale, mind you. 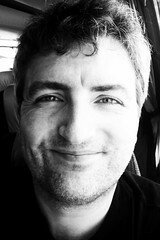 The actual area is far smaller, about a couple of pixels’ worth in this image, or as the above video says, the head of a pin held at arm’s length. From Wikipedia: The field that was eventually selected is located at a right ascension of 12h 36m 49.4s and a declination of +62° 12′ 58″; it is approximately 2.6 arcminutes in width, or 1/12 the width of the Moon. All those galaxies far, far away, what would they look like really, really close up? Well, being so far away means not even Hubble nor any other of our existing telescopes will be able to give you a nose-to-nose encounter. Rest assured, though, that each and every one of them is, in the words of Dave Bowman, full of stars. The one galaxy that we can have a closer look at, however, is our nearest neighbour Andromeda, a mere 2½ million light years away. The jaw-drop moment is, or at least it was to me, when you reach the amount of zoom where you see mostly image noise … and then you realize when it keeps on zooming that the “noise” is actually individual stars. Lots and lots and lots of stars, floating like the tiniest droplets in mist, except these droplets are a million miles or more across, and light-years apart. You may also note a considerable difference in star density when comparing the centre of the galaxy to its outer rim territories. I’ve added a few screenshots to demonstrate, but why take my word for it, when you can zoom it yourself right here? Full view, showing about a quarter of the Andromeda Galaxy, like a smooth, translucent veil against the blackness of space, just like we know it already. Almost halfway there, with what looks like background digital image noise. The larger stars you see here are all members of our own Milky Way galaxy. Zoomed in all the way, and the “image noise” resolves into a glittery jumble of individual stars. And if there’s anything we’ve learned about stars in recent years, it is that they tend to have planets around them. This has been shown to be true of stars in our own galaxy, and there is no reason to think that the Andromeda galaxy should be any different in that regard. Here be worlds, upon worlds, upon worlds. I have always been fascinated by the sky. I remember a night, decades ago, standing in my back yard, looking up at the sky. 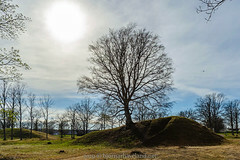 I very suddenly became aware of the depth of what I was looking at. It may not sound like much of a revaluation, but I had to grab on to something. What a marvelous wonder is our universe!